In order to provide prospective students with the best chance at having a great education, we have compiled this list of the top universities and colleges in North Carolina. Some schools may excel at online programs while others may focus exclusively on the traditional, on-campus aspect of higher education. Regardless of the delivery format, these schools excel at providing a quality education for their students. For the nontraditional student, someone with work, with a family, or with any number of different responsibilities, gaining the education needed to move forward in a career, to better your situation or even just to develop yourself, can seem impossible. And while attending a traditional on-campus program may not be possible, there are solutions adaptable to your circumstances. Colleges in North Carolina excel, with some of the oldest, highest praised, most diverse, and most adaptable programs in the country. The universities of North Carolina provide quality and expert online education to anyone in a nontraditional setting, allowing any type of student to learn and achieve, regardless of circumstance. Online education is achieving greater and greater results every day, as it harnesses greater technological advancement and more and more students are willing to excel. To help you choose the school that best fits your needs, we have assembled a list of the best colleges in North Carolina. Each school offers something unique and individual, with strengths that set it apart from its competitors and one of them is just right for you! FSU was founded in 1867 and is the second oldest public university in North Carolina. Since its beginning, FSU has been championing students and creating an environment where education can thrive. With 43 undergraduate programs, 23 master’s degrees, and a doctoral program available completely online, students will be able to succeed in almost any area of study. Undergraduate degrees at Fayetteville are offered to students as degree completion programs, allowing individuals who have completed two years of study to finish their North Carolina degree online. Degrees at Fayetteville are regularly recognized for their excellence, and the school is tied for #43 in Top Public Schools according to U.S. News & World Report. FSU also offers students a rolling admission, allowing them to apply at any time. Known as a research-oriented university, UNC Charlotte offers online degrees in the form of bachelor completion programs, master’s degrees, graduate certificates, and teacher licensure programs. Classes are taught by the same faculty online as on campus, guaranteeing students a quality education regardless of their course of study. UNC Charlotte boasts an average freshman retention rate of 81 percent and is rated #202 in National Universities by U.S. News & World Report. Perhaps the greatest advantage to online learners though is UNC Charlotte’s partnership with 16 other schools in the UNC system. This partnership allows online students much greater flexibility because it enables them to complete classes at a partnering university and apply the credit to their degree at UNC Charlotte. WCU’s bachelor degree completion programs are available to students entirely online, with the exception of the hybrid Engineering Technology Program. Western Carolina is highly ranked, tying at #13 in Top Public Schools and #37 in Regional Universities South by U.S. News & World Report. The student-to-faculty ratio at the school is a low 16:1 and 67 percent of full-time students receive some kind of financial aid. Thanks to a new program from the State of North Carolina called NC Promise, tuition at WCU will be dramatically reduced for all undergraduate students (including residential and online students) starting Fall 2018. In Durham, North Carolina Central University is within the Research Triangle with areas in biotechnology information, biomedics, social, health, and behavior. While this public institution is heavily involved in the sciences, they also pride themselves in offering unique art opportunities like their Jazz study program. The law program on campus is also nationally recognized for being among the top ten most popular law schools. With an online degree program that has been around for almost 60 years, ECU was one of the first institutions to offer fully online degrees to students. Currently, 75 online programs are available in the form of online degrees and degree completion programs. ECU also demonstrates its dedication to education through its online Lifelong Learning Program. This program is available to adults over 50 and allows them to obtain an education without the pressure of grades, entrance exams or other traditional academic pressures. As a military friendly university, special programs are also designed for those in the armed forces. A&T is traditionally and primarily still an African American university, and can boast more African American graduates in the fields of engineering and accounting than any other historically Black institution of higher learning in the country. The majority of engineering graduates also report having a job lined up prior to completing their studies. While A&T emphasizes study in Agricultural and Technical studies, over 20 degrees and certificates are available for study at the bachelor’s, master’s, and doctoral level. Students enrolling online at North Carolina A&T State University receive program coordinators who help students learn about and utilize their resources and develop a plan for graduation. GWU is a Baptist based university founded in 1905. Known as a “character building college,” GWU focuses on what they consider to be the whole value of the student. This includes helping students develop well-rounded skills and meaningful relationships, particularly with university faculty. In an effort to help facilitate these relationships, student classes are kept small with a student to faculty ratio of 13:1. The university offers students online degrees in the form of undergraduate and graduate degrees. Gardner-Webb University is tied for #220 in National Universities by U.S. News & World Report and has also received high rankings for their online business and nursing programs. Unfortunately, due to state requirements, online programs are not available to students living in California, Massachusetts, Florida or New Jersey. Apex School of Theology was founded in 1995 and offers online courses that can lead to several degrees including an associate degree in Christian education, bachelor’s degree in theology, master’s degree in Christian education, Master of Arts in Christian counseling, and a Master of Divinity degree. Students can also take Continuing Education courses online. Apex is accredited by the Transnational Association of Christian Colleges and Schools (TRACS), which is recognized by the United States Department of Education. Apex offers Federal Pell Grants, Federal loans, Veterans Administration Educational Benefits, Presidential Scholarships, and interest-free payment plans to qualified students. Davidson College is a small, private, liberal arts school situated in the small town of Davidson, North Carolina. Davidson College has small classes averaging only 15 students, and it offers 26 majors, in addition to Interdisciplinary Studies. Almost one-fourth of the school is involved in a sport at some point during their stay at Davidson College, and 80 percent of students have had a hand in international work before graduation. NC State offers students degrees either entirely online or in a hybrid format for the flexibility and preference that best fits the student’s needs. Classes are taught both synchronously and asynchronously depending on the course. North Carolina’s attention and care for its students are evidenced in it’s low 14:1 student-to-faculty ratio and remarkably high 75 percent graduation rate. An extensive and worldwide alumni network is also available to recent graduates, providing access to countless professional connections and opportunities. The University of Mount Olive is a private, faith-based university providing a transformative educational experience for recent high school graduates, college transfers, and adult students. UMO is one of the most unique, fastest growing, and most affordable private educational institutions in North Carolina. Seated, one-night a week degree programs are available for working adults in Mount Olive, Fayetteville at the Partnership for Children, Jacksonville, New Bern, Research Triangle Park, Seymour Johnson Air Force Base, Smithfield at Johnston Community College, Washington, and Wilmington. Online programs are also available including the associate degree in General Studies, bachelor degree programs in Criminal Justice & Criminology and the RN to BSN, and graduate programs including the Master of Business Administration, Master of Education, and Master of Science in Nursing. US News and World Report has ranked UMO as the 19th best regional college in 2018. The University of North Carolina School of the Arts is a small public school. It is the most prestigious art school in the state. Located in Winston-Salem, the school aims to help students excel in programs like dance, drama, design, music, filmmaking, and production. Their small classes with a student-to-faculty ratio of 8:1 encourage students to share their talents in a more personal setting. The University of North Carolina at Wilmington is a medium-sized, public school with a strong sense of community and place. Being on the coast, the view and possibilities are incredible for college life. While almost 90 percent of the students are from North Carolina, 21 countries are still represented among the student population. UNCW offers five undergraduate degrees and nine graduate degrees online and has a mix of online and blended (or hybrid) courses to choose from. Students can access their classes on the Blackboard online learning platform. Heritage Bible College is a coeducational Bible college that was founded in 1971. Students can pursue a Bachelor of Religious Education with a major in Pastoral Ministry or Worship and Music. A Bachelor of Religious Education (BRE) in Biblical Studies is available with a Christian Counseling track, Discipleship track, Missions and Evangelism track, or a Youth Ministry track. For students wishing to attend a Christian college for their first two years before transferring to a four-year institution, an Associate in Christian Studies is also available. All programs of study are taught online. They all provide a strong and comprehensive knowledge of the Bible, Christian theology and college-level general studies. Students at App State receive their North Carolina online education from the same faculty that teaches on-campus courses and enjoy the small class ratio of 16:1. Degrees are offered to students as either an undergraduate degree completion program or a completely online master’s degree. Appalachian State enjoys high rankings, being rated #3 in Top Public Schools, and #9 in Regional Universities South by U.S. News & World Report. The University of North Carolina at Greensboro has been deemed a military-friendly school for four years in a row and has received other national rankings for more than 16 years in a row. UNCG offers eight degrees completely online that are both high-quality and affordable, with all online classes authorized to be taught in all 50 states and Puerto Rico. The student-to-faculty ratio is approximately 18:1. UNCG is accredited by the Southern Association of Colleges and Schools Commission on Colleges to award bachelor’s, master’s, specialist, and doctoral degrees. Pfeiffer University is associated with the United Methodist Church and offers students an education with a uniquely Christian perspective. Classes are offered either entirely online or in a hybrid format as degree completion or online graduate programs. 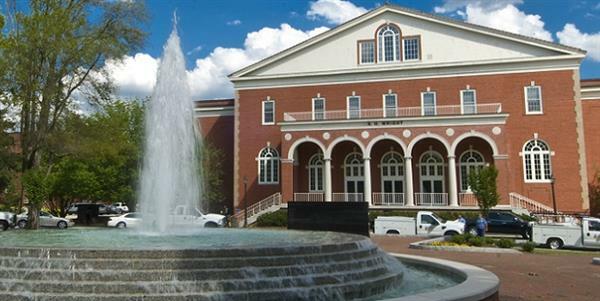 Pfeiffer University is rated #84 in Regional Universities South by U.S. News & World Report. Courses at UNC-Chapel Hill are offered entirely online, in a hybrid format, or online as a distance student. This variety allows students to learn in the manner that is the most convenient and works best for their individual needs. UNC-Chapel Hill is currently ranked #30 in National Universities by U.S. News & World Report. It also puts North Carolina residents first. At least 82 percent of the incoming freshman class must be made up of North Carolina residents. Piedmont International University is a Bible-centered institution offering students a wide variety of online programs including high school dual enrollment, single year certificates, undergraduate degrees, and graduate degrees. Classes are offered at the astoundingly small student-to-faculty ratio of 9:1 and 96 percent of students receive some type of financial aid. For prospective students who may be hesitant to enroll, Piedmont offers an online demo, allowing students to try undergraduate or graduate level courses and determine if online learning is right for them. As a medium, private, liberal arts university, Elon University focuses on engaged and experiential learning. The institution is among the top with regards to producing not only Fulbright Student Scholars but also Teach for America and Peace Corps volunteers. The average class size consists of 20 students in order to encourage mentoring relationships between students and faculty. Though none of its degrees are available completely online, Elon has many individual courses that are offered over the summer in an online format. Montreat is a private, nondenominational Christian college founded in 1916 that incorporates faith and Christian values into its education. The school academically is best known for its state of the art cyber security program and for its 100 percent placement rate for biology majors applying to medical school. Montreat strongly supports its students and does all that it can to make learning more convenient and accessible. In this effort, 99 percent of students receive some type of financial aid. Online classes are designed to be completed in five to eight weeks. Campbell University first began offering coursework to students online in 1999, making it one of the oldest North Carolina online colleges. In its spirit of advancement and improvement, Campbell also offers prospective students more online degree program options than any other private school in North Carolina. This Baptist based institution offers its students a low 19:1 student-to-faculty ratio and class completion in a convenient eight-week format. Campbell is also a military-friendly university, with a long history of offering military and veteran students additional educational opportunities. While Barton College affiliates itself with Christianity, it strongly welcomes all faiths and backgrounds to their institution. Classes are offered to students in eight-week courses throughout the year. While the majority of these classes can be completed online, some on-campus participation may be required. Barton is tied for #13 place in Regional Colleges South by U.S. News & World Report. Barton is known to encourage students to challenge ideas and debate viewpoints, helping them to uncover the truth and greater understanding in their educational pursuits. Students benefit from an 11:1 student-to-faculty ratio and an average of 91 percent of students receive some type of financial aid. John Wesley University strives to follow its Christian mandate by providing online learners with flexible and quality education. With an online program specifically designed for students working and caring for families, John Wesley reduces as many of the obstacles found in on-campus learning as possible. These include the need to commute or physically be present on campus and many of the costs generally associated with attending a university. As North Carolina’s designated public liberal arts university, the University of North Carolina at Asheville offers hands-on learning opportunities, close collaboration with faculty and peers, and an interdisciplinary curriculum in an undergraduate-focused setting. UNC Asheville is consistently ranked as a top-ten public liberal arts college in the nation by U.S. News & World Report and was ranked No. 2 nationally on The Princeton Review’s 2018 “Best Schools for Making an Impact” list. With more than 30 majors in the arts and sciences, students are encouraged to explore their interests and apply their knowledge by participating in research, internships, study abroad programs, and service projects. While Salem College is a private college designed for women, men over the age of 23 are allowed to enroll in their adult learner online program. As the 13th oldest college in the country, Salem has a long history of providing academic success to students. It also stands apart by being the only women’s online institution in North Carolina. While classes in the distance program are primarily offered online, students are required to participate in an internship and a two-weekend on-campus seminar. The school is tied at #122 in National Liberal Arts Colleges by U.S. News & World Report. This private Methodist university has long been known as a pillar of academic standing. In addition to traditional online undergraduate and graduate programs, Duke shows their dedication to education by their continuing education and alumni education program. These programs are designed for working professionals who want to advance their careers through individual classes. Duke is rated #8 in National Universities by U.S. News & World Report and their online nursing graduate program is tied for #3 in Best Online Graduate Nursing Program. Free online trial courses are also available for prospective students who are unsure if Duke’s online programs are right for them. Catawba College is a small, private, liberal arts college located in residential Salisbury, North Carolina. The school was founded by the German Reformed Church but is now affiliated with the United Church of Christ, which encourages the students to have good character in all of their actions. The school offers over 70 different fields of study and allows students to create their own individualized major. Catawba has an evening undergraduate program that helps working adults earn a Bachelor of Business Administration or a Bachelor of Arts in Education degree. Classes are either offered as a hybrid face-to-face and online format or completely online. Craven Community College was founded in 1965 and serves more than 13,000 students between its two campuses and online learning community. It uses the Moodle online learning platform and has 9 associate degrees, 10 diplomas, and 24 certificates available for online students to choose from. CCC notes that not all online courses are offered every semester, stating that course offerings depend on the availability of instructors and the number of students enrolling in a particular program or course. St. Andrews, a branch of Webber International University, is a non-profit, private university. Classes are available to distance and nontraditional students both in a hybrid format and entirely online. Class sizes are kept small to provide individual attention and emphasis to students and classes typically last eight weeks. St. Andrews’ mission is to help students develop the knowledge and qualifications for a lifetime of success. In order to achieve this goal, particular emphasis is placed on oral and written communication and critical thinking. Students are also given a wide array of tools for success like remote library access, academic and career advising, and online tutoring. William Peace University was founded in 1857 as Peace Institute and has been affiliated with the Presbyterian church for more than 150 years. WPU prides itself on having an innovative and up-to-date curriculum and coursework, especially since more than a dozen majors, minors, and concentrations, all taught through a variety of mediums, have been added within the last five years. For students needing the flexibility, WPU has an Adult & Professional Studies department that offers seven degrees completely online—every course for every online degree is offered every semester. Classes have six start dates throughout the year and a student-to-faculty ratio of 15:1. ECSU has the best interest in mind for its students, and strongly encourages students to complete their evaluation survey before applying, ensuring they are prepared and ready for online learning. ECSU is well known for their convenient, inclusive website and online resources that make it simple and easy to do homework remotely. Students have access to dozens of online classes, both available at ECSU and those schools within the UNC system. Because of ECSU’s relationship with UNC universities, students are able to take classes from a UNC university and apply it to their ECSU degree. With an astounding student-to-faculty ratio of 9:1, Queens University of Charlotte is the perfect school for students seeking to pursue an online graduate degree. Queens offers students five quality graduate degrees in the fields of Health Professions, Business, Marketing, Visual Arts and Performing Arts. Queens is tied for #61 in Best Online Graduate Education Programs by U.S. News & World Report. Lees-McRae College strives to help students discover their purpose. Lees-McRae educates and inspires students to approach life and work from a creative, collaborative, and critical perspective in preparation for diverse careers and environments. Online degrees are offered to students as degree completion programs and the school currently offers five online programs: criminal justice, business administration, elementary education, human services and nursing. Courses are completed entirely online and students have access to all the campus resources available to their on-campus counterparts. Wake Forest University boasts a low student-to-faculty ratio of 11:1, giving students small class sizes and individualized attention. The school ranks #27 in Best Colleges in the Nation, #6 in Best Undergraduate Teaching and #28 in Best Value by U.S. News & World Report. Wake Forest’s motto, Pro Humanitate (for humanity), demonstrates the calling they issue to their students. Wake believes that knowledge, talents, and skills acquired throughout life and at their institution help better the community and the lives of others. The school encourages students to find their own personal way to leave the world a little better. WFU doesn’t offer any undergraduate degrees fully online, but does offer three online master’s programs—Master of Arts in School Counseling, Master of Arts in Clinical Mental Health Counseling, Master of Arts in Human Services, and Master of Studies in Law (MSL). At the University of North Carolina at Pembroke, all online and distance learning programs are taught by the same highly-qualified faculty that teaches the on-campus programs. There are four undergraduate and three undergraduate degrees that are available entirely online. The online MBA is also considered an accelerated program that can be completed in as little as 12 months. Because of a program called the NC Promise, beginning fall 2018 students will pay significantly less tuition and will save up to $10,000 over the course of four years. UNCP has a student-to-faculty ratio of 16:1. Rated #16 in Best Value Schools by U.S. News & World Report, LRU is known for their small class sizes and service learning opportunities. Students take classes in either a hybrid or entirely online format allowing them to choose the style that best fits their needs. Lenoir Rhyne has a rolling admission for its students allowing them to apply at any time. This medium-sized, private, liberal arts school was founded in 1924 in High Point but didn’t become a university until 1991. Affiliated with the United Methodist Church, High Point University encourages a balance in life and learning. The school also focuses on preparing students for careers with career planning courses, LinkedIn sessions, and on-campus interviews. Winston-Salem State University is a mid-sized, public university that specializes in health sciences. Being a historically black institution, the school continues to uphold a diverse student body. They provide a flexible curriculum with over 40 majors available to accommodate each student and their unique background, with eight degrees and certificates for online distance learners to choose from. Meredith College is a small, private, liberal arts college based in Raleigh, North Carolina. With a rich history in supporting women’s rights, the college is currently a national source of important research with regards to women’s issues. Today they are a coeducational institution that offers over 80 undergraduate programs. Vance-Granville Community College has many options for students to choose from, and several degrees are available completely online, while others are a hybrid of online and on-campus courses. VGCC uses the Moodle course management system to deliver its online, hybrid, and enhanced courses. Online courses are asynchronous — meaning students won’t have to attend online classes at a specific time. Classes will consist of weekly assignments, readings, discussions, and occasional group work, as well as exams and other activities designed to enhance the learning experience. If you know of a school that deserves recognition but wasn’t included on this list, please reach out to us today! We’re constantly looking for the best schools across the country, offering top-level education and phenomenal student support.